Cambodia’s first LGBTQ dance company has big dreams. Prumsodun Ok is a Khmer classical dancer, choreographer, and the founding artistic director behind Prumsodun Ok and Natyarasa, Cambodia’s first LGBTQ dance company. The company began in Ok’s living room in 2015, with the goal of not only preserving a 1,000-year-old art form, but also creating innovative works that reflect the LGBTQ experience in Cambodia. Subscribe to our YouTube channel to explore more Atlas Obscura videos. 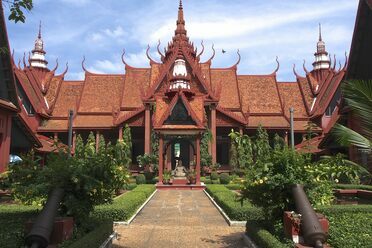 Explore the vibrant art, religion, and food culture of the Kingdom of Cambodia, and spend time with the country's leading artists and performers. Capturing the years of work it takes to master a craft. The many contradictions of a diplomat's daughter who wanted all her work destroyed. "I desire only to live in this world for your sake," the king wrote to him. A ballerina weeps over the hammer and sickle in Mao's production of "The Red Detachment of Women."